A beautiful day in Perth today set the backdrop for for an even better day of flying. Arriving at Jandakot Airport today for my scheduled 8am flight, I was straight out to do my pre-flight checks. There was an eager, yet nervous anticipation of this flight, it was to be my first Training Area Solo flight. The first training area solo second major milestone during your flight training. It is when all of the skills required to successfully leave the airport, be able to bring the plane down safely in the event of an engine failure, conduct steep turns, recover from stalls, return to the airport and land it in cross winds. All must be demonstrated to a level where a class 1 instructor feels you are safe. Cameron signed me out at 8:25am today and at 8:27 I was sitting in the little Cessna 152 (VH-AOH) with the checklist in my hand. Prior to heading out to the plane, Cameron sat me down and asked me what my plan was. I described the Jandakot departure and the list of skills I was going to practice. His reply was “Good, but this is going to be the first time you can go and explore alone. So my advice is to go up, explore the training area and have fun! You are learning to fly for exactly this reason and there will be plenty of time to practice those skills later.” It was the best advice I had today! So sitting there with that checklist, then in the run up bay, pushing full throttle at takeoff and every other minute of the flight, I had those words in the back of my mind, “have fun!” Flying out to the training area I had a look around the map and chose to go find pipehead dam in the hills. On the way I did medium turns, climbs, decents and straight and level flight. In the distance I could make out 2 dams, but with a quick look on the map, the northern dam was Serpentine and it was the target. Pipehead dam is a small narrow dam in front of Serpentine Dam, so the bigger was the easiest to spot. On arrival I did a medium level turn around and enjoyed the fantastic views of both dams from 2500 feet. My little GoPro HD camera caught some great views which I’ll post later. Leaving the hills I did steep turns and a dance with another aircraft as it flew past. Later I worked out it was Adam in the other Air Australia Cessna 152 (VH-IGX) and one of his other students. 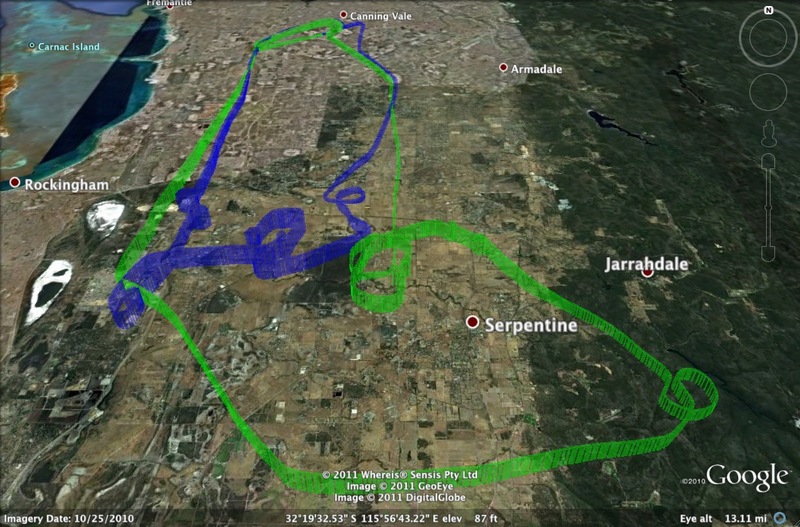 At this point I decided to do a Practice Forced Landing (PFL) before heading back to Jandakot. Having not been my strongest skill area, getting in as many as possible in is a good thing! Returning to Jandakot there was a stack of traffic and the Air Traffic Controller was getting a little testy with any of the pilots. I got a call to join upwind at 1500ft and watched out the window as another aircraft took directly below me. Its quite a sight. I joined behind a twin engine aircraft and landed fine. After the flight I had a debrief with Cameron, then Adam when he returned. My smile is still beaming large! A week earlier, I’d anticipated the excitement of the first area solo, so pre-emptively booked another flight for the arvo. Adam called around midday to tell me VH-AOH had gone offline, so if I could delay till 4:30 VH-IGX would be available. All good after an apology to mum :-p (mothers day and all). Anyway, it was no less exciting, but with the fading light I had to get a move on. Adam signed me out and I was away. For the entire flight I was treated with a spectacular views of the sky and it continued to get better the longer it went. This flight I focused on medium and steep turns and PFLs. 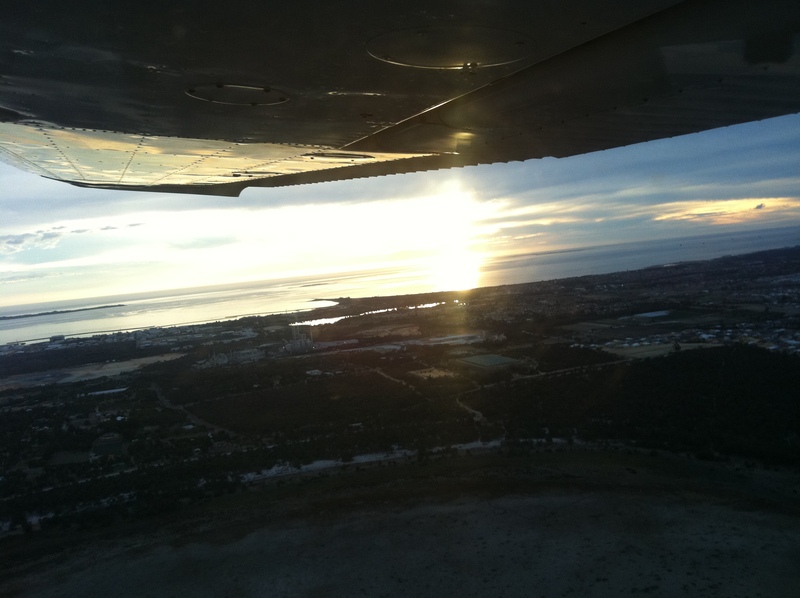 With the fading light, I turned back towards Jandakot a little earlier. My reward was an amazingly colourful sky! On approaching Jandakot the airport had prepared for darkness and the lighting was in full swing. I was given the unusual instruction for a left base into runway 24 right. With two other aircraft late in the normal right hand circuit, I was a little apprehensive. I switched on the landing lights to make sure the tower and other aircraft could easily spot me. On joining base, the other aircraft became visible with his landing lights blared directly at me. He turned and I followed him in. He was slow and I backed off to give him as much room as possible. He selfishly used the full length of the runway to save himself taxi time which left me with coming over the airport boundary without landing clearance. The tower gave me clearance acknowledging the other aircraft was about to pull off and in the end save me the trouble of a darkening circuit. This entry was posted in cessna 152, Jandakot, Pilot License, Solo and tagged Area Solo, Cessna 152, Jandakot, PFL, Practice Forced Landing, Steep Turns. Bookmark the permalink. Excellent stuff mate, and what great weather you had today. Having fun is the key. Some great photos, and an all round good job on this site. Really enjoying every post. Great work! !